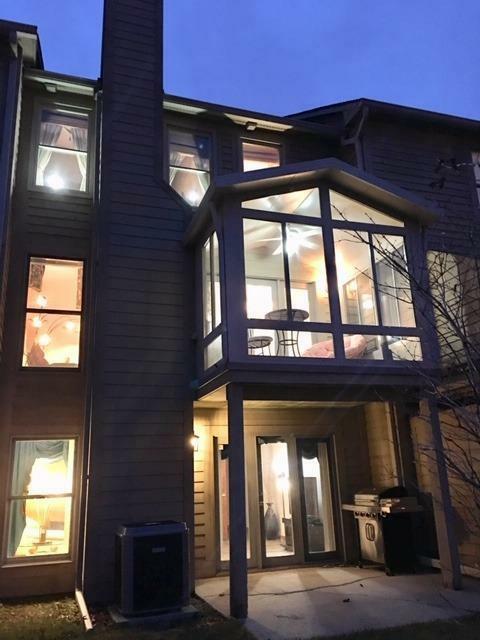 Lovely condo in Oak Meadow subdivision in move-in condition! Two Master bedrooms w/ vaulted ceilings and walk-in closets; master w/ Jacuzzi soaking tub, and guest bedroom 11x18 w/sitting area. 2 1/2 updated bathrooms. Unique 4 seasons sun room w/ vaulted ceiling. Freshly painted & new carpet. Lower level features French doors leading to office, wood burning fireplace & new flooring, Gas log fireplace in airy living room. Kitchen & breakfast nook with windows overlooking courtyard. Many updates including skylight, lighting, carpeting, dishwasher, microwave, refrigerator, washer/dryer, sink & garbage disposal, newer over-sized air conditioner, windows, foyer tile & bathroom tile. December 2018 removed wallpaper & painted in kitchen. Unit is 1448 sq ft plus 440 sq ft (1888 Total) finished in walk-out lower level leading to patio & could have 3rd bedroom. Includes use of club house, pool, hot tub & tennis court. New Hardy Plank Siding 2018.